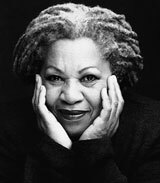 Toni Morrison is an American author and academic. Born Chloe Wofford in 1931 in Lorain, Ohio, she is the second of four children in a working class family, and began reading avidly from a young age, favoring authors like Jane Austen and Leo Tolstoy. Her father also recounted African-American folktales, an oral tradition that would later influence Morrison’s own writing. After receiving her BA in English at Howard University (it was there she changed her name from Chloe to Toni), Morrison went to Cornell University to complete her MA, again in English. Her thesis explored themes of suicide in the works of William Faulkner and Virginia Woolf. Morrison returned to Howard as an English professor and began writing fiction, including a short story about a black girl who yearned for blue eyes. The story became the basis for her 1970 novel The Bluest Eye. Much of Morrison’s work explores experiences of black women in a white, male-dominated society but she has shied away from calling her work feminist, believing the label is off-putting for some readers. Nevertheless, critics continue to classify her work as exemplifying post-modern feminist characteristics. Morrison married fellow Howard faculty member Harold Morrison in 1958. They had two children and divorced in 1964, after which Morrison moved to New York, where she became an editor for Random House. Morrison continued her love affair with teaching as well as writing. She taught English at two branches of the State University of New York, and later at Princeton. In her career she has published ten novels and is best known for her fifth novel, Beloved, for which she won the Pulitzer Prize for Fiction, the American Book Award, the Anisfield-Wolf Book Award, and the Frederic G. Melcher Book Award. She was also awarded the Nobel Prize for Literature in 1993 – the first black woman to receive the honor. Morrison retired from teaching in 2006, but still lectures and writes. 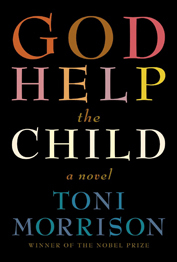 Her most recent novel, God Help the Child, was published in 2015 and tells the story of a very black-skinned black child whose lighter-skinned black parents are ashamed of her. It explores themes of pereption and hierarchy not only between races, but within them, as well, and the roles that light and darkness play. Morrison has also written three children's books in collaboration with her youngest son, Slade Morrison. Toni Morrison w/ Slade Morrison. What's your favorite Toni Morrison book?